VST-AU JUNO-106 Editor, MIDI Editor from reKon Audio. reKon audio has updated its VST-AU JUNO-106 Editor, a real-time MIDI synth editor that allows you control of sound parameters on the Roland Juno-106 synthesizer. Fixed the ‘Chorus 1′ not getting set properly. Editor now (‘remembers’) loads the last used settings for both MIDI settings and current preset. 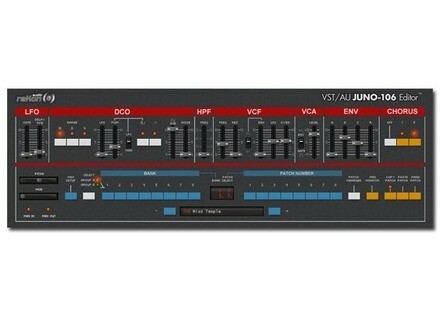 VST-AU JUNO-106 Editor for PC and Mac (VST/AU/Standalone) is available to purchase for $69.95 USD. Manx Destiny Manx has released Destiny, an Arp Odessey emulation for Windows. MOTU 4PRE Hybrid MOTU have introduced their new 4PRE Hybrid (Firewire and USB) audio interface. Rode Soundbooth Announced RØDE Microphones announces that the RØDE Soundbooth, a microphone demonstration application that allows users to audition a selection of RØDE microphones, recorded across a range of instruments.